Writer Daniel Defoe devotes a few pages to the town in A tour thro' the Whole Island of Great Britain. 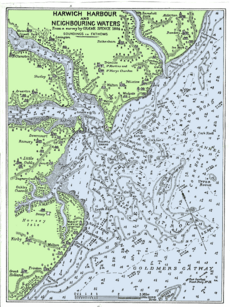 Visiting in 1722, he noted its formidable fort and harbour "of a vast extent". 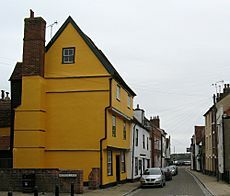 The town, he recounts, was also known for an unusual spring rising on Beacon Hill (a promontory to the north-east of the town), which "petrified" clay, allowing it to be used to pave Harwich's streets and build its walls. The locals also claimed that "the same spring is said to turn wood into iron", but Defoe put this down to the presence of "copperas" in the water. Regarding the atmosphere of the town, he states: "Harwich is a town of hurry and business, not much of gaiety and pleasure; yet the inhabitants seem warm in their nests and some of them are very wealthy". Harwich Dockyard was established as a Royal Navy Dockyard in 1652. It ceased to operate as a Royal Dockyard in 1713 (though a Royal Navy presence was maintained until 1829). 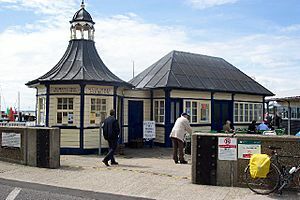 During the Second World War parts of Harwich were again requisitioned for naval use, and ships were based at HMS Badger; Badger was decommissioned in 1946, but the Royal Naval Auxiliary Service maintained a headquarters on the site until 1992. The Royal Navy is no longer present in Harwich but Harwich International Port at nearby Parkeston continues to offer regular ferry services to the Hook of Holland (Hoek van Holland) in the Netherlands. 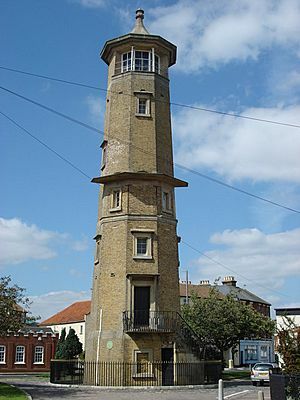 Many operations of the large container port at Felixstowe and of Trinity House, the lighthouse authority, are managed from Harwich. The regular street plan with principal thoroughfares connected by numerous small alleys indicates the town’s medieval origins, although many buildings of this period are hidden behind 18th century facades. 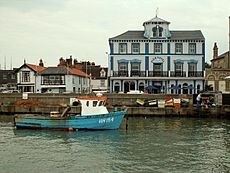 The Pier Hotel of 1860 and the building that was the Great Eastern Hotel of 1864 can both been seen on the quayside, both reflecting the town's new importance to travellers following the arrival of the railway line from Colchester in 1854. In 1923, The Great Eastern Hotel was closed by the newly formed LNER, as the Great Eastern Railway had opened a new hotel with the same name at the new passenger port at Parkeston Quay, causing a decline in numbers. 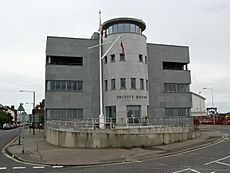 The hotel became the Harwich Town Hall, which included the Magistrates Court and, following changes in local government, was sold and divided into apartments. Harwich Facts for Kids. Kiddle Encyclopedia.